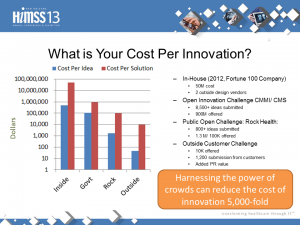 What is your cost per Innovation? There are many ways to drive innovation faster and better. 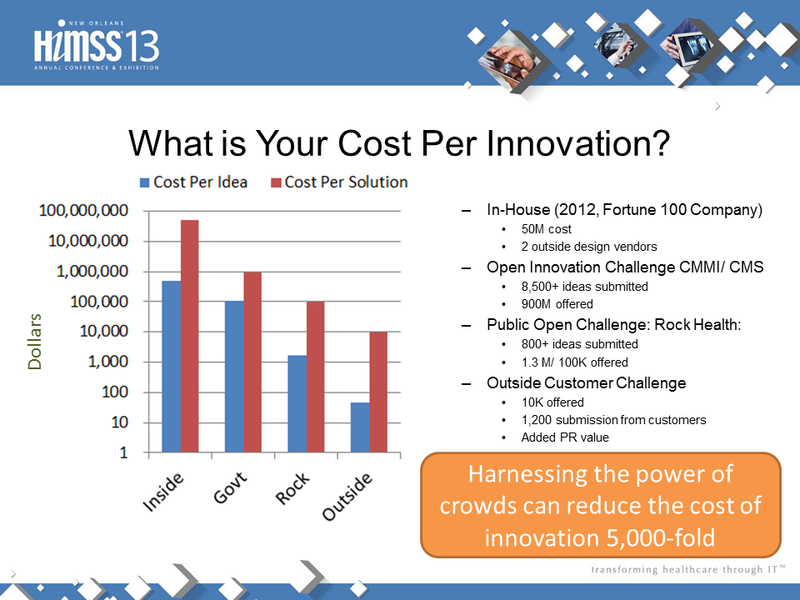 I talked about this at HIMSS this year and put together this slide that shows one metric of effectiveness, cost per idea or product generated. Innovation itself is being innovated upon, decreasing the cost of new ideas by a thousandfold. It is truly inspiring to behold and nothing less than revolutionary. The latest iteration is exemplified by a challenge sponsored by The Office of the National Coordinator for Health Information Technology and the National Cancer Institute with the help of Challenge.gov, Health 2.0, and us! We also have enlisted a crowd of amazing collaborators to help including Stupid Cancer, Cancer 101, ACS, Happtique/ mHealthzone, the Society for Participatory Medicine, PCORI, Livestrong, O’Rielly Media, HIBC.TV, This Week in Oncology, Indiegogo, and eHI. Later, they will ask the general public to weigh in on which ideas they like best. The Challenge is called “Crowds Care for Cancer” and is all about supporting new ideas that help the 14 million Cancer Survivors in America stay connected with their care and live longer, better lives. The application period ends next Week, so go Apply Now. To me, the most amazing thing about this challenge is that ONC/ NCI is looking to fund three great ideas from conception through creation and then adoption, in just under 3 months. This is so fast and so open, literally three new ideas and solutions to a real problem could go from non-existent to users and well funded in under 90 days. The requirement for the application period is just wire frames and mockups. To win Phase 2 you just need a prototype! This is supporting innovation at the inception, and truly revolutionary. And if that isn’t enough, part of the prize package is a Crowdfunding Optimization program from us! All three finalists will go live on stage and on MedStartr on June 3rd at Health Datapalooza. It should be fantastic! It is truly a new and innovative way to drive innovation. Why? Because the Crowds will be heard and they will support the innovations that they care about, bringing three new ideas from conception to fruition in under a month. Truly amazing. Just to get your idea in front of this all star committee I am recommending that all apply. But I digress, what I really wanted to talk about are the four main ways that organizations are driving innovation in healthcare, sometimes with the help of crowds. The Crowds Care 4 Cancer Challenge (follow #CC4C13 on twitter) is a great example of the latest iteration, but let’s review the four fold path to healthcare enlightenment and look at what they cost. Grants – External Grand Challenges– The old reliable grant based challenge model is alive and well, with over 30 billion given out by the US government alone in 2011. One of the most aggressive programs, the CMS / CMMI program gave out almost a billion dollars to almost a thousand projects and received over 8,000 submissions. This is about as good as it gets for a government grant program and an order of magnitude better than in house. It still allows the innovators to stay out of the public review, so it affords some privacy, but you never know who your reviewers are. Enough said there. Accelerators – External Incubation – The most popular new way to drive innovation so far this century has been the Accelerator / Incubator model. It actually isn’t that new an idea, but with Y-Combinator, TechStars, and corporate “garages” from Nike, IBM, HP and others gaining popularity it has become the standard of startups, the pedigree one should have before getting serious funding. Rock Health is the leader in the healthcare space and many more are doing well with the model, HealthBox, Startup Health, and new comer WeMultiply, to name a few. I mentor for a few and can tell you that the service startups gets is highly valuable, exactly the type of help that was non-existent in the 90s when I started in the startup game. The 2012 Fall class at Rock Health was offer 100,000 each and generated over 800 applicants for 13 spots. So, doing the numbers (see below) this is once again, an order of magnitude better than the previous model. Beautiful, no? Great companies coming out faster than ever too! Open Public Challenges – Since 2009 with the American Recovery and Reinvestment Act, Challenges have become a major way that the US government can support advances in science and medicine, but corporations have been doing this for a long time and going back to the 1700s, even ideas like naval longitudinal navigation were the result of public challenges. A recent challenge asked customers for their ideas, providing a $10,000 prize to the winner and (this is important) partnership, not ownership, to manufacture and distribute the idea. The metrics on this one are once again an order of magnitude better with over 1,000 submissions. Powered by Crowd Sourcing, Open Public challenges do have their own logistical issues such as judging, and the public nature of the solutions. Also added in often is “crowdjudging” which allows top finalists to garner votes, or better yet, is based upon adoption like the current Allscripts open challenge. And now we have a fifth option, “Crowd Challenges” that not only include crowdsourcing, but actual crowdfunding of the prizes too, driving adoption, feedback, co-design, and partnerships free form and in an open format. In theory, such programs could actually Create innovation programs from scratch, with no capital needed to initiate them, just crowd funding. We will try that later this Summer. For now, we are sticking to a more traditional corporate/ government/ foundation sponsorship model and it is going well so far. When we have metrics on the first Crowds Care Challenge we will publish them. I expect it will be in the right side of the chart here. The best part about these open challenges is that they harness the creativity of millions, not dozens or hundreds and drive adoption, awareness, and extra funding by design. When crowds get involved, revolutionary ideas happen. Stay tuned! To learn more about the MedStartr Crowds Cure Challenge platform and Open Innovation services, please be welcome to visit those pages here.